After a budget which exposed strains in the coalition agenda senior Liberal Democrat ministers defend a rise in VAT despite campaigning against the move during the election. But Vince Cable admits to Channel 4 News the Lib Dems election campaign against a VAT rise may not have been the best design. Treasury Chief Secretary and Liberal Democrat Danny Alexander said the move to hike VAT to 20 per cent in January was the only alternative to still deeper spending cuts. It comes a day after Chancellor George Osborne set out what he described as "tough but fair" cuts to public spending in the coalition's emergency budget. A £11bn benefit squeeze was also included in an austerity package he said would clear the structural deficit by the time of the next general election in 2015. More changes are expected in the autumn spending review when some government departments face cuts in the order of 25 per cent, the chancellor warned. He sought to soften the blow by restoring the state pension link to earnings from next year, raising income tax allowances for basic rate payers and a £2bn boost for poor families. 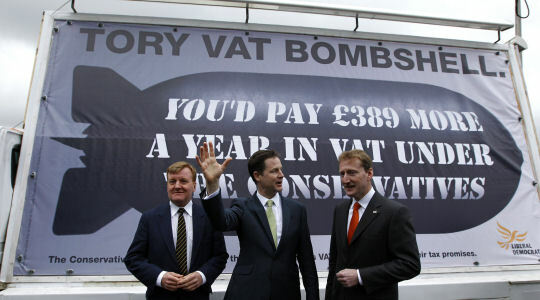 A Liberal Democrat election poster warns of hidden Tory tax hikes. However the VAT measure sparked deep unease among Liberal Democrats as Labour accused them of acting as "fig leaves" for a budget that would still hit the most vulnerable hardest. During prime minister's questions today acting Labour leader Harriet Harman clashed angrily with David Cameron over the effect of the emergency budget on pensioners and families. Harman repeatedly accused the prime minister of not being "straight" with the public about the impact of the government's proposals. Cameron fiercely rejected her charges, saying £1bn was being put into pensions. Business Secretary Vince Cable admitted today that there are "risks" associated with the public finance squeeze. Cable was criticised in the Commons today by shadow chancellor Alistair Darling who accused him and the Liberal Democrats of going back on their election campaign pledges to fight VAT rises. But Cable said he changed his mind and backed the hike to 20 per cent along with swingeing cuts because senior officials in the Bank of England had told him there was a "serious threat" to the economy. During resumed debate on the budget in the Commons, Cable was asked by Labour MP Phil Wilson what the government would do if the "massive gamble" for the country failed and derailed the recovery. Mr Cable said: "You say it's a gamble, there is a risk. There are risks of tightening fiscal policy too quickly, of course there are risks. But there are risks of doing nothing or less. We have had to balance those risks and we have concluded that we had to act." Last night the business secretary hit back at claims it was a "Tory budget" following criticism for the VAT hike. During the April general election campaign the Liberal Democrats campaigned against "a hidden Tory tax" and launched a poster campaign dubbed the "Tory tax bombshell". Speaking to Channel 4 News Cable, who was shadow Chancellor for the Liberal Democrats before the coalition was formed, said the worst-off had been safe guarded by the measures which were now necessary. He said: "Following that advertisement, and it may not have been the best designed advertisement campaign that's ever been considered, I was repeatedly asked...what our views were on VAT and I said many times that this is not something that can be ruled out - no sensible person would rule it out, given the seriousness of the financial situation." - Emergency budget: will you be out of pocket? The business secretary added: "Things have changed in the last few weeks." "The international situation has deteriorated very badly indeed - that's why we had to move very quickly on it." Prime Minister David Cameron and his Liberal Democrat deputy Nick Clegg will appear on television later today to show a united front. But Colchester MP Bob Russell gave a stark warning to potentially damaging splits to the coalition by threatening not to vote for the budget. 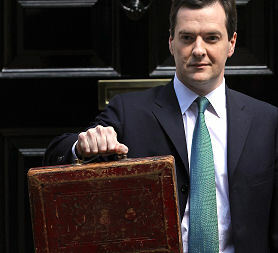 "I can't see myself at the moment voting for the budget," he said yesterday. Other left-wing Lib Dems admitted "unease" - including among ministers - but played down the prospect of a revolt, insisting MPs had accepted the need for stark action to cut the deficit. The coalition Treasury has a big macroeconomic strategy, writes economics editor Faisal Islam. Borrowing slashed so that economy-wide interest rates can stay lower for longer. It is how they have made the argument to middle England for the spending and tax pain announced yesterday. Unfortunate, then, that within hours of the "austerity budget", the Bank of England's monetary policy committee reveals it's first single vote in favour of an interest rate rise for nearly two years. To be clear, Andrew Sentance was outvoted by the other members of the MPC, however the concerns about the persistence of high inflation are clearly shared by others on the committee. This was not a verdict on yesterday, as the vote occurred a fortnight ago. Nonetheless, the budget documents already show much higher outlook for inflation next year, mainly as a result of the VAT rise. The projection for the retail price index is nearly one full percentage point higher. "It is not a joyful budget but looking back it was the right thing," said Tim Farron - pointing to the inclusion of Lib Dem ideas on income tax thresholds and capital gains tax. Mr Alexander, who was applauded when he addressed a meeting of the party's MPs after the statement, denied misleading voters. "What we actually said in the election was that we would seek to reduce the deficit through spending but only if, on the grounds of fairness, we needed additional tax rises would we seek one. "We want to see income tax thresholds rise to help with incentives to work. That means VAT was the unavoidable choice," he told the BBC. Sources last night said that the prime minister had discussed the tough austerity measures with US President Barack Obama. Following a phone call the leaders were said to be "on the same page" over the strategy despite US fears that cutting too fast could damage the global economic recovery. They will meet this weekend at a gathering of G20 nations in Canada which is set to be dominated by talks over the best way to deal with the downturn. Emergency budget: will you be out of pocket?